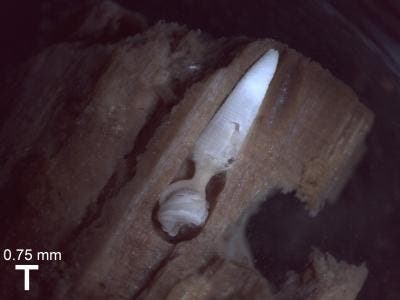 A wood-boring clam inside a chunk of wood at the bottom of the ocean. Credit: Jenna Judge. Some clams have evolved the ability to eat wood that makes its way to the bottom of the ocean. Remarkably, these organisms — which are the only kind besides termites that are known to digest wood — are surprisingly diverse. According to a new study, there are six different groups (genera) of wood-boring clams, comprising approximately 60 different species. Three of these genera have only been recently identified in a new study published by biologists at the Field Museum. Like other clams, wood-boring clams have two shells covering a soft body. However, these clams also have an additional long, tube-like organ called a siphon which extends out from the shells. When the mollusk is buried deep inside a sunken piece of wood, the siphon allows the animal to pull in water and extract oxygen with the gills. But, while their phallic appearance might elicit a chuckle, it’s their diet that makes these creatures truly interesting. The wood-boring clams flex their muscles and rock their hard shells against the wood, like a cutting tool, scraping off little bits. The clams then eat the sawdust, which they digest with the help of bacteria in their gills. As the clams burrow, they somehow seem to know when they are near another clam’s tunnel and they avoid breaking into it, but how they are able to sense their neighbors is a puzzle. Wood bored by shipworm. Credit: Carnegie Museum of Natural History. 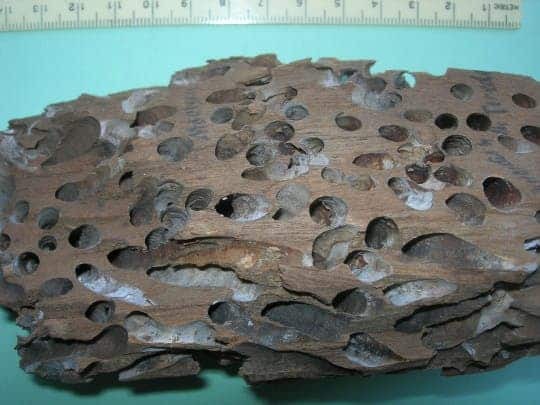 The wood-boring clams, known as shipworms, are a centuries-old scourge to shipping activities because they weaken wooden ships and pilings. In order to keep them away, all sorts of coatings are applied to wooden ships and pilings. In the past, people used coatings that contained tributyltin (TBT), but this practice has been banned in most places around the world since TBT causes reproductive problems in aquatic organisms. You’d think that organisms which only feed on wood aren’t that many or diverse. That’s what Janet Voight, Associate Curator of Invertebrate Zoology at the Field Museum, thought as well. 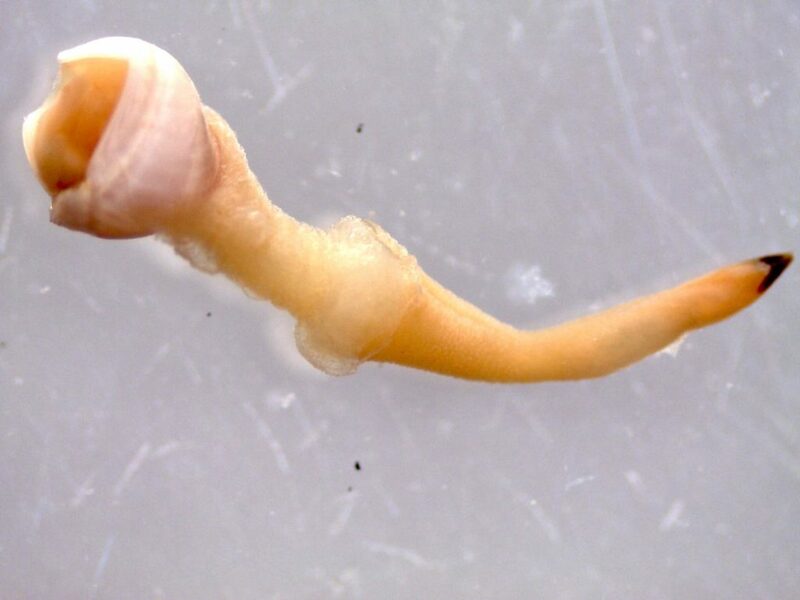 But in a recent study in which Voight and colleagues studied both specimens themselves and their DNA, the researchers determined that there at least six different genera that make up the wood-boring clam family. 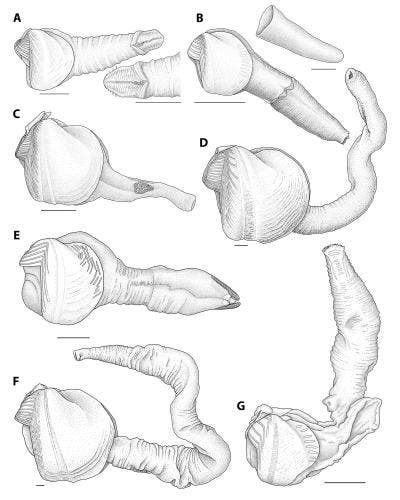 Three of these genera have been described for the first time in the new study. The authors also identified a completely new species lurking in one of the museum’s collections, which they named gilsonorum, in honor of the Gilsons, who have invented scientific tools and supported the museum’s efforts. The new genera have been named Abditoconus, Spiniapex, and Feaya. Drawings showing different members of the wood-boring clam family. Credit: Lisa Kanellos. “You think, am I seeing everything that’s there, are there cryptic species, am I over-splitting them and going crazy? It’s really scary checking yourself against the DNA, but the results matching what I found gave me a lot of confidence,” says Voight. Close-up of one of the newly described wood-boring clams. Credit: Angelo Bernardino and Paulo Sumida. Wood-boring clams can be quite tiny, their shells no larger than a pea even as adults. However, their impact on human activities and deep-sea ecosystems can be massive when they settle in a big population. On a related note, there are also rock-boring clams whose shells are adapted for abrasion. Unlike wood-boring clams, the rock-boring variety does not feed on rock particles — instead, it uses the rock for protection from predators.